I just returned from Chengdu. I had to go to the American Consulate there to get a new passport. My passport expires August 4, 2014 after ten years. It is possible to designate an agent to renew it, but you can’t do it by mail. Somebody has to go there. I gave myself over an hour and a half to go to the train station. My train left at 8:15 PM on Thursday, the 24th, and arrived in the Chengdu East Station 11 hours later at 7 AM. I had a lower bunk in the hard sleeper. I read for a couple hours and then slept about 9 hours. All in all, it was a comfortable trip. The cost was 190 rmb. Over an hour and a half seems like a long time, but getting to the train station during rush hour can be problematic. I figured 45 minutes by bus, but then got that uncomfortable feeling, like what about traffic jams, etc. A taxi, if I could get one, would be a lot less, maybe an half hour. As luck would have it, I caught a motorcycle. The motorcycle took 15 minutes. The cost was 20 rmb. Travelling by motorcycle is worth mention. Most people say, don’t do it. It’s too dangerous. I agree. But if you do decide to take a motor cycle you will get there fast. No traffic lights or traffic jams will stop you. If you are careful, you can pick a safer option. Like eating food from street vendors, you need to be careful. First, make sure the driver has a helmet. If he doesn’t worry about his own safety, he certainly won’t worry about yours. Second, older is better than younger. If he is old and still doing this, he is probably a safe driver. Finally, check out his equipment. If he has clean equipment in good repair, he is probably responsible, and safe. My cycle driver had all three, and it was sweet getting to the train station with a safe hour and 15 minutes before departure. Chengdu I found the subway inside the train immediately across from the exit area where I departed the train area. I had to wait in the information line, no English, so it pays to have your destination written down in Chinese. It cost 4 rmb to go from the east side to the southwest, where I met my friend Daisy. The subway was less than a half hour, and by taxi it probably would have been an hour and a half and over 60 rmb. Daisy and her husband, Johnson have cars so transportation was no problem until departing the city. I flew back on a 10:30 PM plane, using China Southern. It was delayed about an hour and I arrived in Guiyang at about 1 AM on the 27th. The taxi was a problem. The first guy wanted to charge 50 rmb, I got out when he wouldn’t budge. The second guy charged 40. It should be 25 to 35, but at one in the morning, 40 was ok. 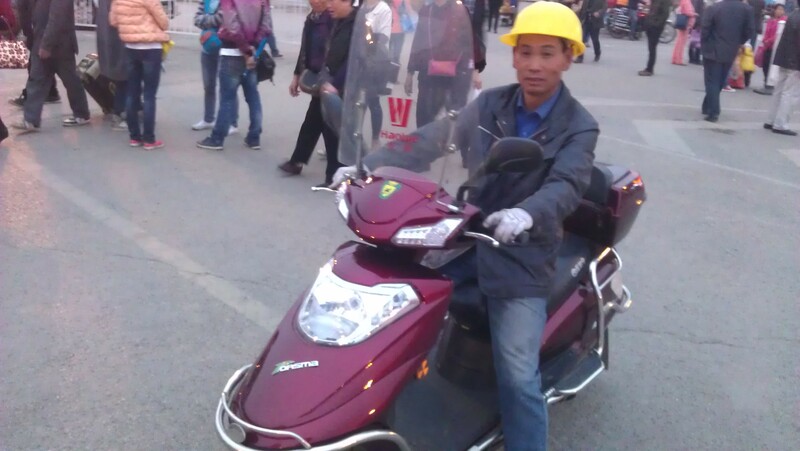 He didn’t know the way to Guizhou Normal University! I had to give him directions. My printer is still down from my move so I didn’t print the application. I figured I on filling the form out on arrival at the Consulate. Everything went ok, except for the picture. I took pictures with me but they were too small. When they say two inches by two inches on a white background, that is exactly what they want. My photos were two inches high, but not a full 2 inches wide. There is a photo studio directly across from the Consulate, so it cost me another 30 rmb to resolve this issue. I checked the extra pages option. I had run out of pages a year ago and it cost an extra trip to Chengdu and 70 USD. If you plan to travel very much, get the extra pages. There is no extra charge for the extra pages if you get them from the outset. My passport expires August 4, 2014 and I can’t get a new visa for my next year teaching without the new passport. I had gone home on December 23 of last year and had almost 8 weeks of vacation, with which to renew my passport. The process requires four to six weeks. I elected not to renew the passport in Chengdu. The reason is that I couldn’t get as clear answer about my old Chinese Visa and my new passport. Would the active visa be transferred to the new passport? Would I get the old passport back? If I sent my old passport to the US State Department, and they kept it, my new passport might not have the active Chinese Visa. 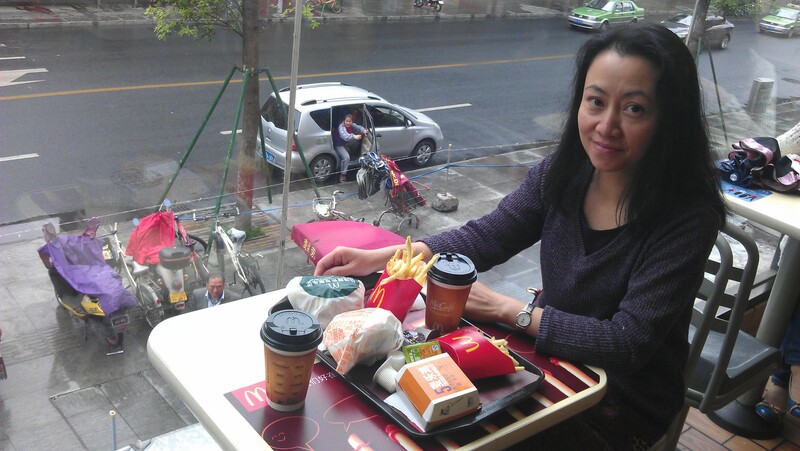 I was afraid that I couldn’t return to China without replacing the visa. The Chengdu web site details the process quite well: http://chengdu.usembassy-china.org.cn/passports.html . After filling out the form and paying the money I connected with Daisy, her husband Johnson, and their daughter Jean. It was fun catching up with old friends. I even found a Big Mac. This is Daisy. I only spent about 36 hours there, but I was able to visit the biggest building in Asia, so I’m told. I don’t know who measures these things, but it was big. 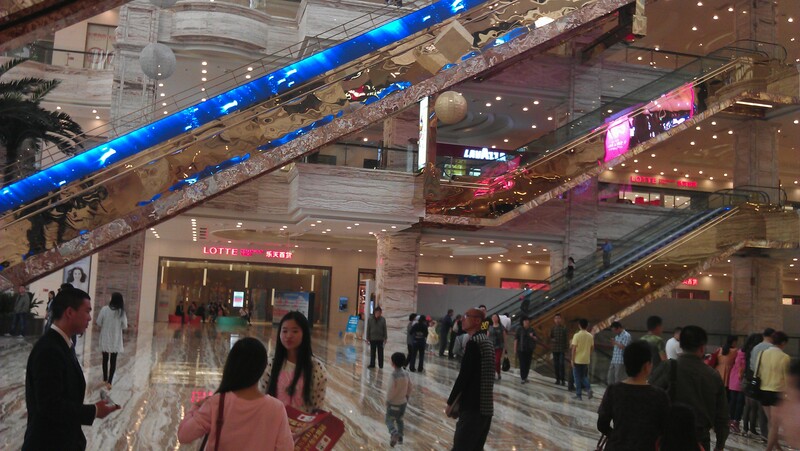 It is a shopping center called “Global Center”. 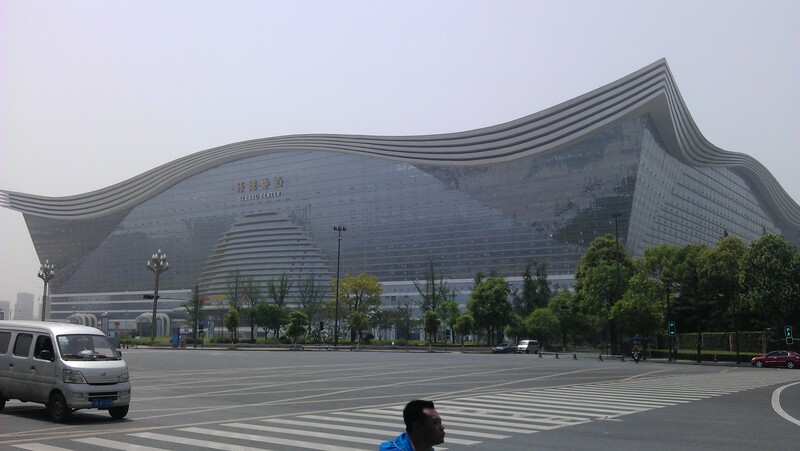 The Global Center is a shopping center and it is so large that I had trouble getting the whole thing in a picture. 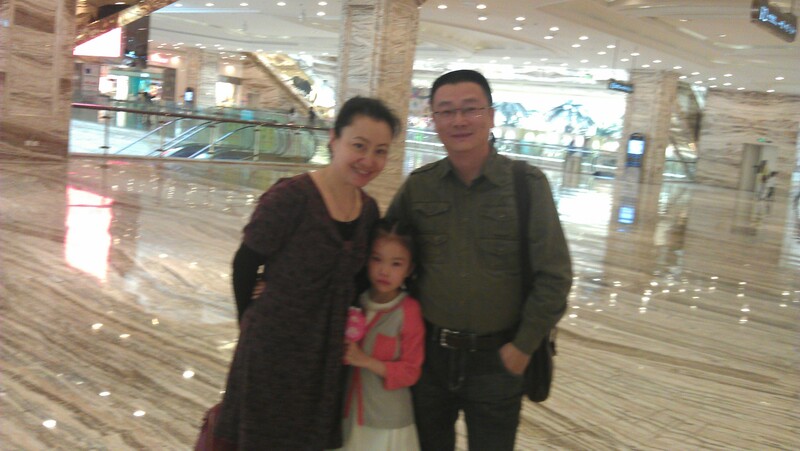 I am asking friends with pictures and stories about Guizhou to become members of this blog. It’s a good place to keep your pictures. If you are active, I can give you a category for your pictures and stories only. Just use the sign up for a new account on the right side of this page and you can begin soon.